The “A” plot in “Housewarming,” the latest installment of Schitt’s Creek, is so familiar you might roll your eyes at it: During a game of Spin the Bottle at his boyfriend’s “high-school slumber party”-themed shindig, David Rose (series co-creator Daniel Levy) lands a kiss from his sister’s studly, soused beau, an act that promises, as one character proclaims, to create “DRAMMAAA!” In truth, the stakes are astoundingly minimal—a sulk in the corner is the night’s worst consequence, and all is forgiven by episode’s end—which means “Housewarming” is the perfect place to start my appreciation of TV’s most relatable romance. With their half-sweet, half-adversarial, opposites-attract rapport, David and Patrick (the disarming Noah Reid) achieve a delicate balance between sitcom charm and the screwball singe. It’s not that Schitt’s Creek never goes in for grand gestures. In the series’ finest hour, last season’s “Open Mic,” Patrick dedicates a gorgeous, tender cover of “Simply the Best” to David at their store’s open mic night, turning the latter’s embarrassed grimace into a bashful grin. (Maybe not as swoon-worthy as Keith Carradine crooning “I’m Easy” to Lily Tomlin in Nashville, but still a glorious riff.) Climax aside, though, “Open Mic” follows the couple’s usual template, a study in contrasts that resolves in companionship at once rumpled and satisfying, lived-in and fresh: Patrick, a light-haired regular Joe in blue jeans and a crisp white shirt, floats an idea—an open mic night, say, or selling plungers, or making Jell-O shots—that David, a dark-haired rich kid in eye-popping couture, rejects out of hand as too embarrassing to bear, resulting in the faintly vinegary back-and-forth that constitutes the subplot’s “action.” “Open Mic” ultimately sweeps David’s fears away, and he off his feet, but up to that point its focus is on wearing down his defenses. Patrick’s escalating suggestions (to David, threats)—to hold the open mic night, to perform at it, to sing, to do so in a fringe vest, to do so in a fringe vest with no shirt underneath—are a form of rom-com needling that resists self-conscious repartee, and the reactions he elicits are priceless. “I’m feeling kind of ill,” David says at one stage, pulling at his collar as if he’s about to break out in hives. 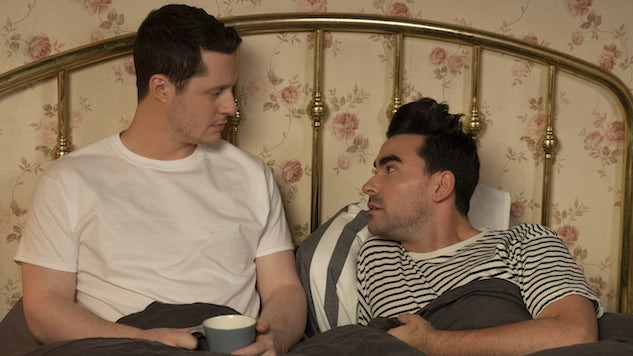 It’s no coincidence that the sweetening of Schitt’s Creek corresponds with the blossoming of the two men’s relationship, first as business partners and then as boyfriends. Patrick’s cracks in David’s armor are a microcosm of the series as a whole, which has evolved from a fish-out-of-water comedy into a watch-the-fishes-swim one, with the once-wealthy Rose family haltingly embracing the ordinariness of their small-town lives. In learning to communicate, to compromise, to coexist, the mostly unglamorous work of being with someone for the first time requires David to drop his pretenses in much the same way that co-running a motel does his former-magnate father, Johnny (Eugene Levy), joining the town choir does his former-soap star mother, Moira (the exceptionally funny Catherine O’Hara), and participating in the social life of Schitt’s Creek does his former-party girl sister, Alexis (Annie Murphy). Being “relatable” isn’t simply the mechanism of Schitt’s Creek’s humor, it’s also the subject: To find a place in their new community, the Roses must relate to their neighbors, to associate, connect, interact, understand. Patrick: For the record, I also respect you and think that you’re a good person. David: It’s just, I said “nice” person. Patrick: You’re a good person. Between this, their clashing outfits, their distinct personalities, even their body language—a constant two-step of leaning away from and turning toward each other that suggests a training regime for fast-twitch muscles, as if to remind us that even the strongest relationship demands the utmost agility—Schitt’s Creek ensures that the romance retains its slight edge, that seesaw of affection and irritation we feel for those we most desperately love. Which, to return to “Housewarming,” is another reason it’s an ideal entree into Schitt’s Creek’s central romance: In expressly flipping the script on David and Patrick’s established formula, the episode marks a new frontier in their, and the series’, development. Though Patrick has, on occasion, thrown up his own defenses, most of these situations have focused on his uncertain sexuality—on David wanting to spend the night for the first time, for instance, or Patrick’s dissembling about his ex-fiancée. “Housewarming,” coming on the heels of his search for a new apartment, squares space for Patrick to grow in other ways. Season Five has yet to construct a scene quite as winsome as the climax of “Open Mic,” but the conclusion of “Housewarming,” in which David’s gentle ribbing teaches Patrick a thing or two about trust, is still a delight, its rhythms that of a relationship setting a new stride. “I’m sorry, are you saying you were jealous?” David teases, asking Patrick to rate his envy’s intensity. “David, I’m not playing this game with you,” he sighs, half-exasperated, before going in for a kiss. It all has the air of a game, of course, except in this game everyone wins. Schitt’s Creek airs Wednesdays at 10 p.m. on Pop TV. Seasons One through Four are now streaming on Netflix.